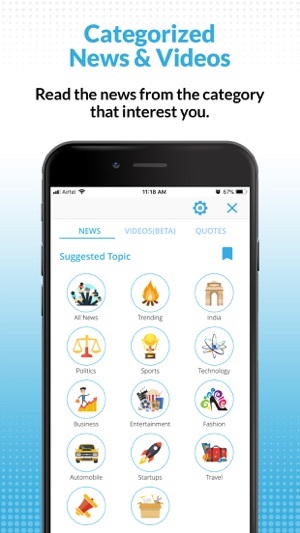 Shortpedia is a short news app that aggregates latest breaking news and videos & summarizes news in 70 words and update you with top news in short spam of time. We choose from multiple national and international news sources and deliver it in Personalized News format to you. Video aggregation App - The videos You Want To Watch And The Ones You Should Watch! With the immense number of choices on video content online, it becomes critically difficult to avoid useless content. People spend more time looking for the videos rather than watching them. With such problems, the person never gets to have the right content at the right time. Resolving the issues of video aggregation sites, Shortpedia becomes the right answer to all your video filtering requirements. The video app brings you the capacity of finding the best videos without wasting your time. This social online video aggregator app improves your video experience by helping you pick the right one according to your own choice. No matter whether you like entertainment videos or the news from a particular category like technology & politics, we have the right video & news content for you. Save your time and enjoy latest videos & inshorts news in 70 words. Today's short news from various English and Hindi newspaper & top news website. * Update you in Seconds : Get popular news in 70 Words , "Short Mein Niptao"
* Trending & Latest Video App : Enjoy Best Videos from Youtube & Facebook from India best news app. * Audio News App : Listen your hindi samachar & today breaking news on the go. * Like, Share & Bookmark : Inform your friends about the recent news & stories. 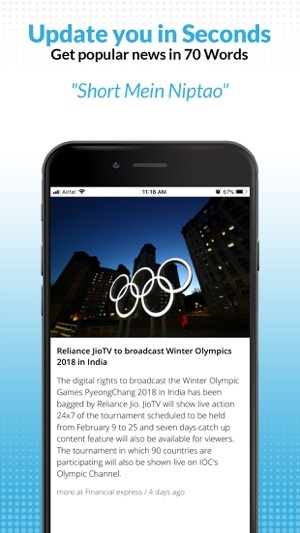 * Offline News App : Read & search google news in Hindi & English. - MoneyControl, Economic Times – Latest Financial News & Tips. - Best News App 2018: inshorts news app for daily news update. - Best viral videos of 2018 : Video news aggregator app & website. - Best Hindi News App: Top hindi samachar app. Notify Us : If at any time you believe that Shortpedia or its users/members have not adhered to these principles, please notify us by e-mail at support@shortpedia.in and we will use all commercially reasonable efforts to promptly determine and correct the problem. It’s a very nice app I may say one of the best apps out there. But from last two days there’s a server error when I open the app and can’t update cards.. Hope it’ll get fixed ASAP. Audio news feature is amazing...save lots of time.